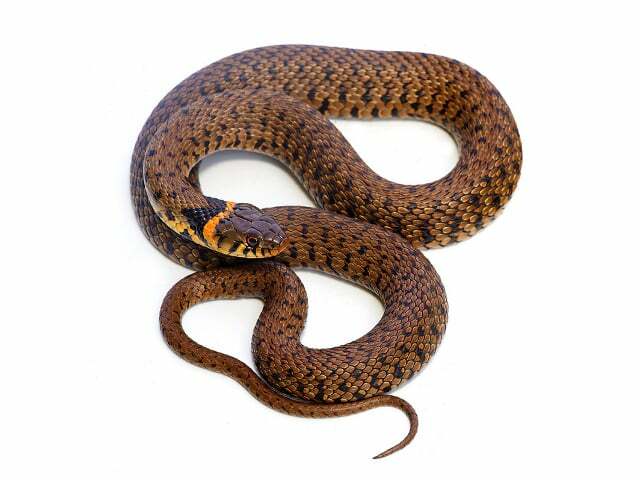 Natrix natrix are medium-sized non-venomous colubrid snakes. In colour, this species is generally an olive tone, brown, blue-grey or greenish, although unusually marked black, grey, silver and bluish animals are known. There are several subspecies of Natrix natrix (N.n.helvetica pictured). The ventral surface is usually cream or yellow, with black or bluish patterns that may become more or less solid towards the posterior part of the body, and are usually much sparser under the throat. The head is clearly set off from the neck, the eyes are large and the snout is rounded. You can find the full article here. This species seems to enjoy exploring and roving around its enclosure, and I prefer to give them a space that is somewhat larger than might be considered necessary; for a small male of up to 0.6 meters (2 feet), a 0.9 x 0.4 meters (2.9 x 1.3 feet) floor space should be adequate, larger females, being somewhat stockier in build, require correspondingly large enclosures; I would suggest not less than 1.2 x 0.5 meters (3.9 x 1.6 feet) for adult females. These sizes may seem excessive, but once the snakes lose their initial shyness, they will be observed to make full use of them and in fact can appear rather restless at certain times of year. If you provide some form of plant cover – whether real or fake – this can also help make the snake feel more secure and they seem to enjoy curling up beneath this, partially exposed to the light, when they are not active. It’s recommended to provide a hide on both sides of the terrarium. Substrate is not terribly important; newspaper can be used with good results, but again I prefer a deeper, more naturalistic substrate, which could be aspen, orchid bark or a similar alternative. My personal choice is a mixture of potting soil, peat and play sand, in roughly equal proportions (enough that the substrate can retain burrows well), and with some fine orchid bark added to the mix. With a substrate of several inches depth, pieces of cork bark can be partially buried beneath it with an entrance revealed that the snakes will often utilize as a hide. I also believe that psychologically snakes gain some security from being able to root around and burrow in the substrate; this varies from species to species but I consider it an important feature in my setups and it is certainly something Natrix will do frequently if allowed to. 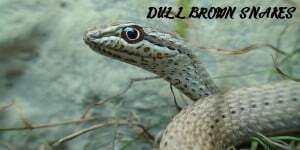 I prefer the more naturalistic approach and consider good lighting foremost in providing for this and other water snake species that spend a great deal of time basking during the day, and this approach will be detailed more here. I offer at least two fluorescent lights to my snakes; a “white light” emitting bulb (my personal choice for many years was a combination of Hagen’s “Life-Glo” or “Life-Glo 2”) which offers good light intensity and is beneficial to plant growth, and another UV emitting bulb (in this case Repti-Glo 10.0). Alternatively, Arcadia T5 lighting is excellent and possibly the best choice on the market today, and these are the bulbs I use at the moment. I currently use a combination of Arcadia Pro and an Arcadia 12% T5 bulb. This is a very temperature tolerant species, as might be surmised form a reptile that inhabits such a wide range of temperate countries. I offer a thermal gradient from 28 C to 22 °C (82-72 °F) during the day, with the warmest localized areas touching 30 °C (86 °F). The warmer areas should not dominate the setup; I consider 23-25 °C (73-77 °F) an ideal ambient temperature for this species throughout most of the enclosure. At night all heat sources can be turned off and the enclosure allowed to fall to room temperature. Offer a water bowl that is large enough for them to soak in. A weekly water bowl change is necessary regardless of whether it appears clean or not. Although these snakes often inhabit fairly humid environments close to water, it is a mistake to try and give them too much humidity in the terrarium as they are susceptible to scale rot just like most other snakes if kept on substrate that is not completely dry. While it is certainly possible to keep them in a semi-aquatic environment, if a water section is provided care must be taken to ensure the land section is completely dry. It is just as easy to keep them in a standard colubrid enclosure with a large water bowl. With regards to relative humidity, they are not fussy snakes and can be kept at normal room humidity. I spray my enclosures lightly every few days in the mornings but other than that no special arrangements are necessary. The first friends of a Grass Snakes keeper are various fish, initially these may need to be fed live but eventually the snakes should learn to accept dead ones. Guppies and other related livebearers (which do not share this problem) should also be used. Ideally the snake should also be encouraged to take pieces of trout, which in the long run is a much more cost-effective method. Many small Natrix will also devour earthworms voraciously, but some individuals won’t. It is a case of trial and error. I find that most babies will come to accept them, if not always readily. Finally, rodents: In my experience, many larger Grass Snakes (especially females) will accept fuzzy mice voluntarily without problems. They seem to prefer the younger pinkies and fuzzies to adult mice, however. On the off-chance that a Grass snake refuses all the above prey items, scenting can be tried, by washing a pinky mouse and then rubbing it on the back of a frog. Personally I believe that an all-rodent diet may be too fatty for these snakes and I try to balance out their meals so that they are eating rodents half the time and fish make up the other half. Grass Snakes in general seem not to like being handled very much; wild caught specimens and more flighty specimens are prone to musking and flicking faeces on the keeper if disturbed too much; I regard them as more of a “look, don’t touch” species and gain more enjoyment from watching this active species moving around its enclosure. That said, certain specimens can become very trusting and one of mine will willingly approach me in search of food when I open its terrarium and investigate my hands without fear. They can lose their timidity over a long period and become a pleasure to deal with. When using bio-active substrates, cleaning and disinfecting is not needed. If you are not using bio-active substrates, regular spot cleaning should be done whenever the cage is soiled. A full cage breakdown should be done once a month. When in shed like all snakes benefit from a slight increase in humidity and may even make use of a humid hide created by placing moist sphagnum moss inside of a hide. When feeding, it is best to offer a variety of species, in order to avoid the possibility of thiamine deficiency, an illness caused by the excess thiaminase present in certain fish species such as goldfish and minnows. A snake fed long-term on these items to the exclusion of all else may suffer an untimely and upsetting death from the deficiency.